I’m not the type of tourist who wants to see every museum that a place has to offer, but I do love to go and spend a couple of hours walking around an art or natural history museum. Often when going to a new museum there is so much to see that I get overwhelmed. One of my favorite ways to slow down and appreciate what’s in front of me (instead of worrying about trying to see everything) is to bring a sketchbook or journal and take some time for focused observation. Think about using both pages of your sketchbook (the spread) to spread out and tell more of a story, adding context to your original illustration. In this post are three examples from my travel sketchbook. I love drawing and thinking about plants, so that is my focus here, but you can obviously choose whatever you like as your subject. 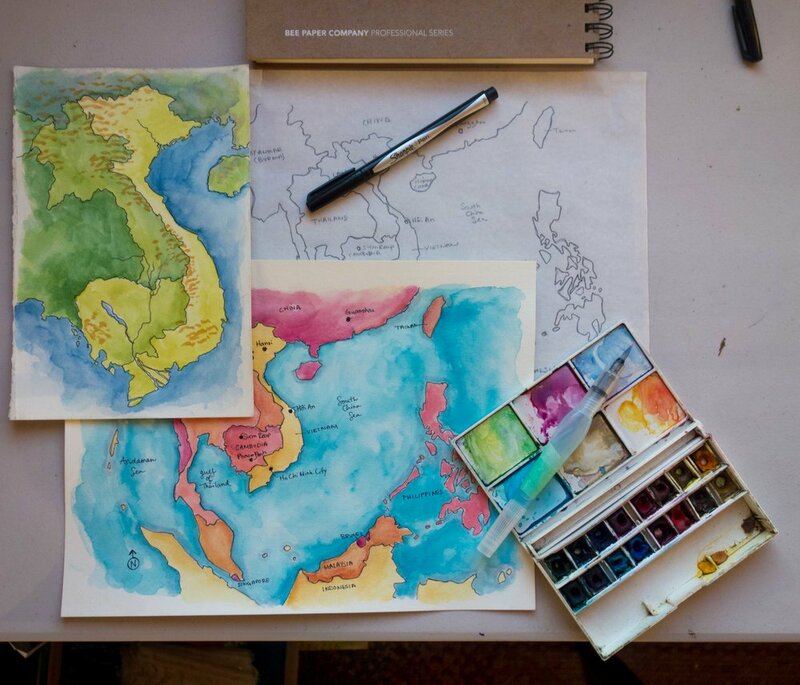 Creating your own field guide or collection can be a great way to organize visual information. You also can be creative with it and don’t need to take it to a Sibley-level of perfection unless you want to. Here is an example of a collection of different tropical flowers I found while walking around Hoi An, Vietnam. I have a 13-hour flight from Vancouver to Guangzhou and then a 5-hour layover in China before getting to Vietnam. I thought it would be fun to write a post on some things you can do on the airplane. I especially wanted to provide some ideas that don’t involve the Internet or watching movies (though that is a great way to pass the time too). I want to prep a few activities that aren’t too mentally grueling and maybe are even a bit relaxing. 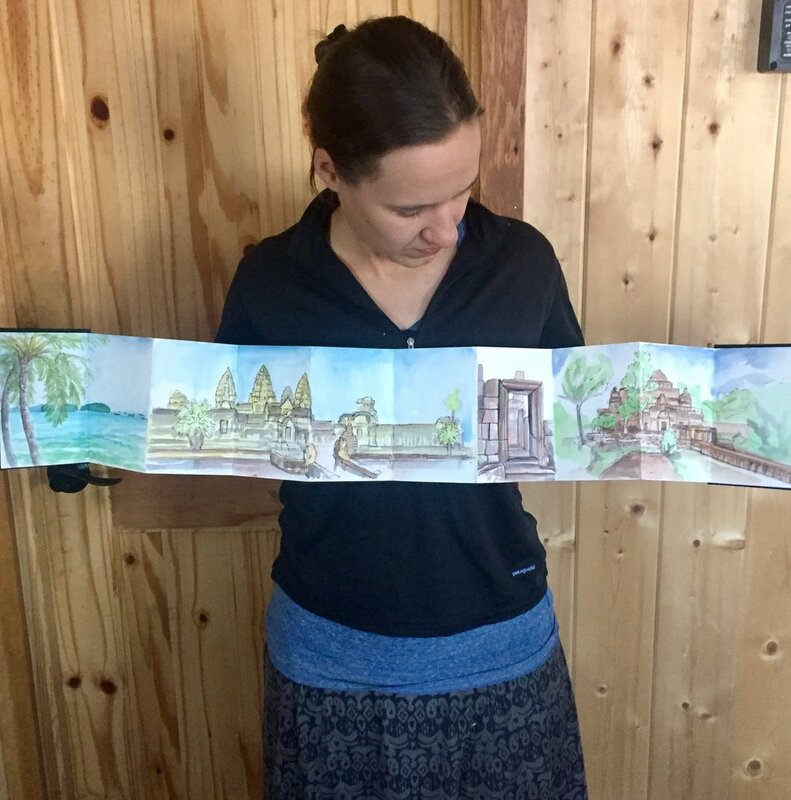 This February I am traveling to Vietnam and Cambodia and I want to take you with me, via my sketchbook. I have cooked up some fun ways to share with you (learn more here), but I am also planning to write a ten-part blog series about my ideas for keeping a travel sketchbook.